In late September 1943, almost 200 veterans of General Montgomery's Eighth Army were arrested for refusing repeated orders to join units of the US Fifth Army at the Salerno beachhead in southern Italy. Within six weeks, all but one had been found guilty of mutiny, their sentences ranging from five years' penal servitude to death. How poorly-equipped Eighth Army veterans, some still recovering from wounds and illness, were needlessly sent as reinforcements to Salerno when Fifth Army men were available. How transit camp authorities deliberately deceived the reinforcements as to their destination. How the defence team at the trial was forced, by lack of time, lack of witnesses and the hostility of the court, to offer a case based on no evidence and doomed to fail. How, after the humane intervention of the adjutant-general and the suspension of the sentences, insensitive staff officers and victimization in their new units caused many mutineers to desert. How, as a result of their convictions, the former war heroes were stripped of their campaign and gallantry medals and branded as cowards. 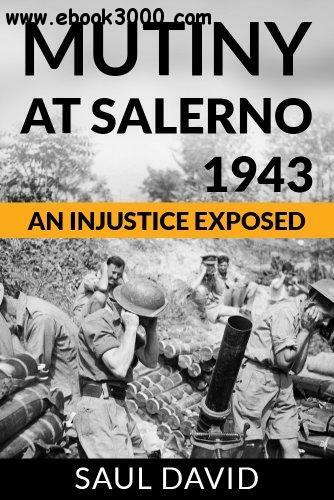 Concluding that the men were victims of a terrible injustice, Mutiny at Salerno provides a compelling case for a free pardon. It is a book that no one interested in World War Two will want to miss. Saul David is Professor of War Studies at the University of Buckingham and the author of several critically acclaimed history books, including The Indian Mutiny: 1857 (short-listed for the Westminster Medal for Military Literature), Prince of Pleasure: The Prince of Wales and the Making of the Regency, Zulu: The Heroism and Tragedy of the Zulu War of 1879 (a Waterstones Military History Book of the Year) and, most recently, Victoria's Wars: The Rise of Empire.He has also written two best-selling historical novels set in the wars of the late 19th Century, Zulu Hart and Hart of Empire. An experienced broadcaster, he has presented and appeared in history programmes for all the major TV channels and is a regular contributor to Radio 4.